Meet the Sand Dunes Beach Townhouse; A 4 story luxury beach house with 4 bedrooms, 3 full baths and 2 half baths and 7 balconies; a designer kitchen, living room, family room, den, private elevator, intercom system, outdoor shower, direct access to a beautiful pool, jacuzzi and of course, the beach. Located on the beach block, only 5 houses from beach. Accommodations include Four Bedrooms: Two Master suites: A Palatial King, and Ocean View Queen; 2 more bedrooms each with a queen bed; as well as a Den with a daybed and trundle and sofabed; a Penthouse Family Room with a queen sofabed, and large party terrace with amazing ocean views. State of the Art and State of Luxury appliances make the open floor plan kitchen 'to die for'; Viking appliances ready to use or not use; as you please. 2 beverage fridges in the family room and living rooms. 2nd full size refrigerator in den. Well stocked kitchen to please the gourmet cook. Washer and Dryer on 3rd floor. Linen and towels provided. Do not call it luxury; just what you need and want; from the ocean and poolside balconies on the second, third and fourth floors; a beautiful pool with kiddie pool and accompanying jacuzzi and chef grilling area at the foot of our entrance; and the use of the Coastal Colors facilities including the fitness center; game room, and an oceanview club room. Fee includes: Bed linens, Towels, Beach towels, beach chairs, beach umbrellas, beach cart, bikes, cleaning service before and after your stay, parking for 3 cars, and taxes. Wildwood Crest is a quiet family community situated behind the best beaches in New Jersey. Nearby you will find the excitement of the Wildwood boardwalk and amusements and/or the charm of historic Cape May. Stephanie and Angela are sisters who own this home with their husbands, Lee and Toni. Stephanie and Lee are from Philadelphia and Angela and Toni are from central Jersey. Stephanie and Angela take great pride in keeping their home beautiful and luxurious and offering services that are not standard in other home rentals. This home has been designed and furnished by a professional interior designer. On the Beach Block with incredible view of the expansive, beautiful Wildwood Crest beach. central air. zoned 4 levels. full size front load washer and dryer in 3rd floor hallway. laundry detergent supplied. broad band wifi available throughout the house, wireless. 20 bath towel sets and 20 beach towels provided. common areas in midrise condo building: 1st floor game room. 2nd floor fitness center. 3rd floor is meeting room. 4th floor library. 5th floor meeting room w/ gorgeous ocean views worth the trip! Incredible open plan living room on 2nd floor leading out to terrace/balconies, both ocean and poolside. viking. full size. dishwasher detergent supplied. Viking refrigerator and wine cooler on the 2nd level main floor; extra full size refrigerator-freezer on the first floor level; and wine cooler and wet bar on Penthouse floor. Professional grade Viking gas cooktop. 6 burners. 20+ spices, sugar, flour, oils, foil, plastic wrap, tupperwear (at the discretion of prior guest usage and replacement). paper towels, garbage bags, dishwashing soap supplied. game room in common condo area. large collection of board games. in common game room but we do supply a couple of pool sticks since the ones in the game room are not always reliably stocked. some sand toys. large collection of board games. x box gaming system and wii systems available inside the home. 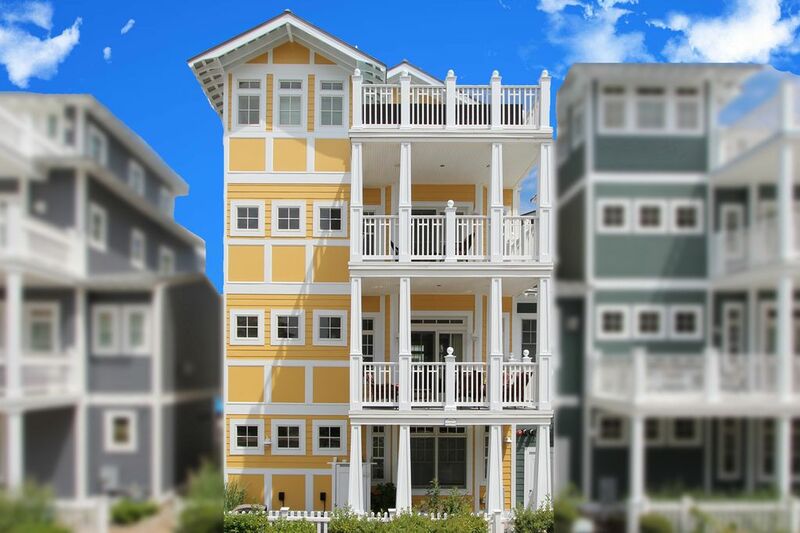 Sand Dunes comes alive with 2 terrace/balconies on each of its top three floors. A beautiful deck/patio overlooking the pool. total of 7 decks. large 4th floor deck with beautiful beach-ocean views. An incredible pool at the foot of our entrance, max depth is 4 feet. separate kiddie pool. 'Sand Dunes', one of the spectacular homes offered at Belldon's Coastal Colors, offers 3323 square feet of living space plus 1257 square feet of decks! 4 bedrooms, 3 baths plus 2 half baths, fully furnished and professionally decorated. Tremondous features and upgrades; like its all been done for you! again I mean everything is provided. The home is so spacious and really set up for a large group. We loved it. We had four families (a baby and two toddlers and a teenager) and it was great for all. The location is awesome and we just love it. I hope they get to entertain many families because this is the way to vacation at the shore. Wildwood Crest is awesome! Such a roomy house with all amenities. With towels, linens and all beach equipment supplied, made the trip so much easier. The pool is awesome and the grandkids loved the game room. The owners, Stephanie and Angela are very nice and accommodating. I highly recommend this house for a big family of all ages. We can't say enough about what a perfect time we had. My husband enjoyed the gourmet kitchen, I enjoyed quietly reading on the many porches, and we all enjoyed quick access to beach and pool. The house is perfectly designed to spend time together in the great open 2nd floor, but you can also find plenty of space if you need some quiet. Thank you so very much for the perfect family vacation! Exceptional home for our family vacation! Our hostess, Stephanie was lovely. She really anticipates your every need. Her property is lovely. Our family of 9 had so much space to enjoy our time together. The location is perfect, steps to the pool and beach. The beds are super comfortable and the pillows are to die for. She provides all the comforts of home. Fully stocked kitchen, everything you need in bathrooms, beach chairs, toys, chairs, umbrellas & cart for the short walk to the beach. All towels& linens. Beach towels are even labeled with cute names so we knew which one belonged to each of us. A welcome basket for all those little things you forget. We couldn’t have been happier with our choice of property & hostess. This is definitely a 5 Star property and we will return. Thank you for a fantastic week. Everything was amazing! We loved the sunsets on the fourth floor deck. Stephanie made sure we had everything we needed to enjoy a wonderful week. The pool and grill area was incredible. Our kids loved the short walks to the beach in the evening. Definitely one of the best family vacations we've ever had. 7 DAY MINIMUM RENTAL FROM SATURDAY TO SATURDAY DURING PEAK SUMMER SEASON. No Cleaning Fees during Peak Summer Season. Unit is professionally cleaned prior to each Rental Term. Any additional maintenance/cleaning costs due to damage, excessive wear and tear, or excessive uncleanliness, will be deducted from Deposit. Unless otherwise agreed, Full Payment must be received by May 15, 2015.